The sun is shining and the birds are singing, there is a bit of blue sky visible and we even have the windows open slightly! Could it be that spring has really arrived? Hope so! It's still a bit on the cool side for playing outdoor gigs, but don't let that put you off from seeing FiddleBop live (but indoors). In just three days time (Saturday 26 April, actually) we are returning to the wonderful Norman Knight pub in Whichford, Warwicks. Tim Young is mine host there, and he might even join us on his cajón (if you don't know what one of these is, then come along and find out. Oh OK, yes you could always look it up on Wikipedia. There, I've made it easier for you lazy ones...) It is always a fun night at the Knight: see you there? 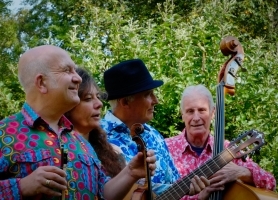 Two forthcoming FiddleBop gigs that we are all particularly excited about are Upton Jazz Festival (in Upton-Upon-Severn, near Worcester) on Saturday 28 June, and - just confirmed - Le QuecumBar ("The World's Premier Django Reinhardt Gypsy Swing Venue": they said that, not us) in South London on Sunday 3 August. Wow! It's going to be a summer to remember! We can hardly wait! Le QuecumBar "The World's Premier Django Reinhardt Gypsy Swing Venue"
Chippy Jazz And Music 2014 The Red Lion, Albion Street, Chipping Norton, Oxon. * Charity gigs may not involve all four FiddleBoppers.